Weather lore or weather proverbs were the most accurate way of forecasting the weather for centuries. Some of them are still well-known phrases and many of them have some truth in them. I have bought together some of the most accurate weather lore here and explain why it works. 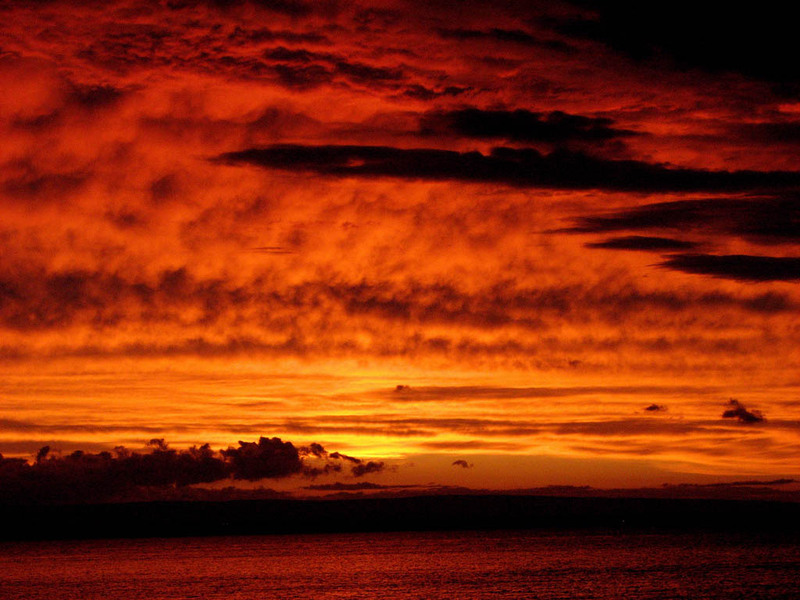 Red sky at night, sailors delight. Red sky in the morning, sailors warning. This proverb is only correct in the mid-latitudes where the weather systems generally travel west to east. It is often quite accurate however it is possible that when the sun is setting the sky clears briefly in the west allowing the sun to shine on the other clouds and the poor weather is still to come. Equally if the sun is rising and there happens to be a few clouds in the west, then it will look like poor weather is coming, but in fact, there may be fair weather. Mares’ tails and mackerel skies make tall ships carry low sails. 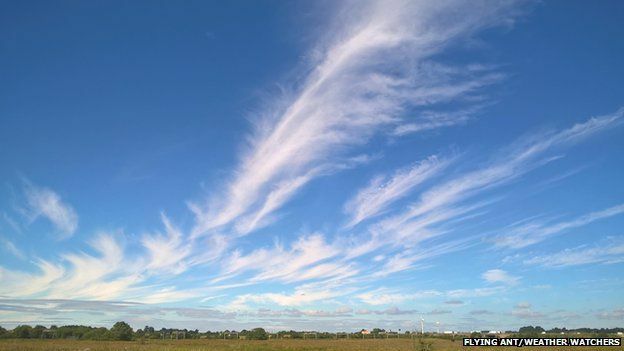 Here ‘Mares’ tails’ refers to cirrus clouds and ‘Mackerel skies’ refers to altocumulus clouds. This sky often means that a depression is coming. These clouds are the first indication of a warm front, so there ill be no rain for the first 12 hours at least. As depressions are windy, it indicates to ships that they should lower their sails in time for the storm. This can be quite accurate as there are almost always cirrus clouds and sometimes altocumulus clouds before a depression. However, altocumulus clouds and cirrus clouds can sometimes be seen without a frontal system approaching. A halo around the sun or moon, means rain or snow coming soon. 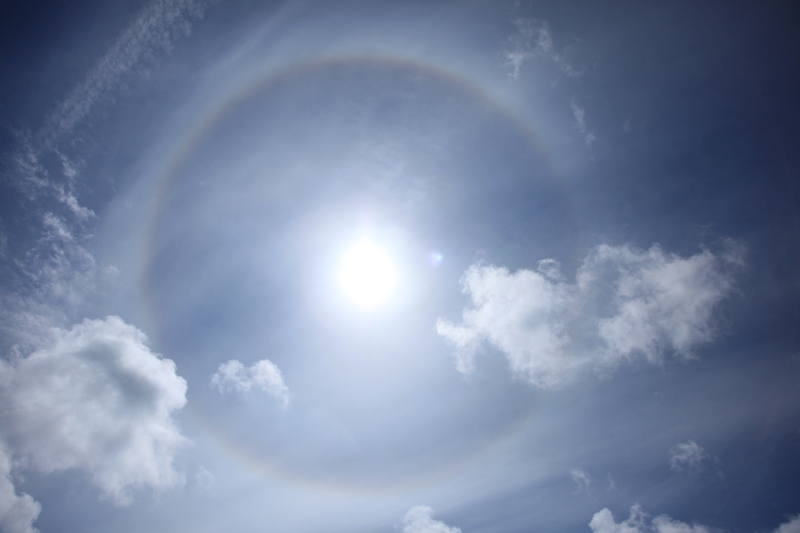 The refraction of light in the ice crystals in cirrostratus clouds causes halos. Cirrostratus clouds are often present before a depression approaches and as we know, depressions bring rain or snow. Cirrostratus clouds are not often seen unless a depression is approaching so this is usually quite accurate. Long foretold, long last. Short notice, soon passed. This is an extremely important proverb, even nowdays. If a weather system is first seen a long time before it actually arrives, then it indicates that it is travelling slowly, so it will pass slowly. However, if a weather system is only first seen just before it arrives then it indicates that it is travelling fast, so it will pass quickly. This also applies to showers, which are only seen for a few minutes before they start, however they only last for a few minutes. This weather proverb is almost always correct and is one that is extremely important to know to forecast the weather. A sunny shower won’t last an hour. A single cumulonimbus cloud (shower cloud) is never bigger than about 15km. Often cumulonimbus clouds join to form a multicell, but multicell clouds do not have sunny gaps between them. This means that if there are sunny breaks between showers, then the showers will pass over in much less than an hour. This is almost always correct due to the nature of cumulonimbus clouds. When your joints all start to ache, rainy weather is at stake. Here is another pressure related proverb. When there is low pressure, it allows tissues to expand in the body which can put pressure on the joints, causing pain. This is why arthritic people often say that they can predict when bad weather is coming. Obviously, this proverb is not the most accurate as your joints could ache due to countless other reasons! If the spiders are many and spinning their webs, the spell will soon be very dry. In high humidity spiders’ webs absorb water and become heavy causing them to be more obvious to prey and to break. As spiders are very sensitive to moisture in the air, they are aware of this so when there is high humidity they will hide away and will not spin their webs. 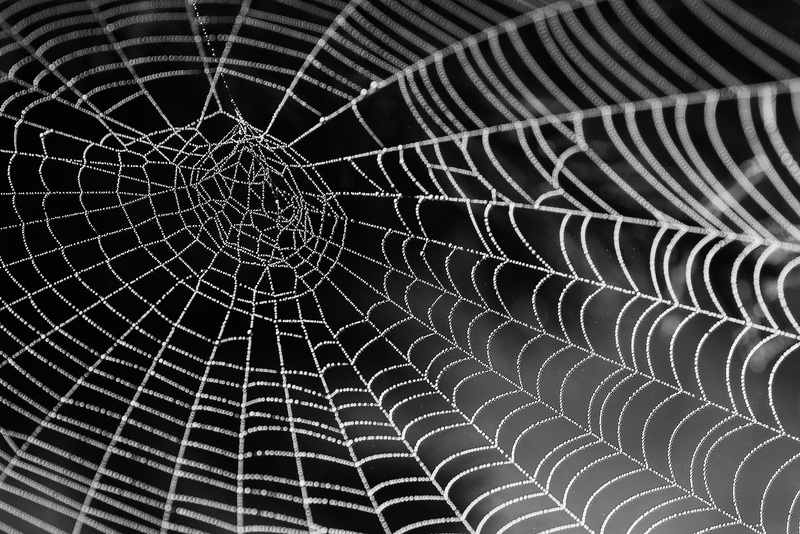 When the spiders sense low humidity, they will come out and spin their webs. This is useful because if there are lots of spiders spinning their webs we know that fair weather is probably here for the next couple of days at least. Sharp rise after low, foretells a stronger blow. The quicker pressure changes, the closer the isobars are together and the stronger the wind will be. A pressure change of about 5-6 millibars in 3 hours will result in a strong breeze with winds of around 25 knots. A change of 8 millibars in 3 hours will result in a gale and a change of 10 millibars in 3 hours will result in a storm. Seagull, seagull stay out from the land, we’ll ne’er have good weather while you’re on the sand. Seabirds and wild fowl react to bad weather signs long before we may know about them. Seagulls which normally forage far out to sea will come close inshore to fish and they will be noisy and will fly carelessly and aimlessly. The counter to this though is on beaches in the summer which will be busier when the weather is good and will attract more seagulls to steal the Cornish pasties. As we have discussed earlier, one of the first signs of a depression is a backing wind along with falling pressure. A depression will often bring gale force winds and squalls as the cold front passes. Find out about more weather lore and many other, more accurate, methods of forecasting the weather in my book “The Message of the Clouds”. My book details how to forecast the weather with the clouds, coastal and mountain weather, weather folklore and it explains how the weather works, so you can understand the reasoning behind your observations. To keep up to date with my latest blog posts and articles, or to get subscriber only deals for my book please sign up to my newsletter. Thanks Simon, That is very kind of you. I love the folklore methods of weather prediction, they were one of the main reasons I wanted to write my book!